Amethyst is the stone of peace and calm, creativity, all healing, an artists stone, it keeps your head in the game, balance and temperance and more. I have quite the collection of amethyst beads in tear drops, faceted brioletes, faceted roundels, chips, coin, natural points and various sizes of rounds. While putting together some amethyst pieces to post for February, I came across this little heart shaped amethyst focal bead. 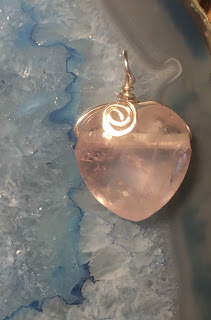 I didn't want to take away from the heart by wrapping it too ornately, so I kept it simple. A bale, and a tiny spiral. Done. The heart shape and smoothness of the stone, really resonated the peace and calm that is associated with this stone. Is amethyst your birthstone or just one of your favorite stones? and remember, be peaceful, and be kind, it's important! !